Suryapet: Minister for Power and SC Development G Jagadish Reddy on Saturday exuded confidence that the TRS candidates will win all the 12 Assembly constituencies in erstwhile Nalgonda district. 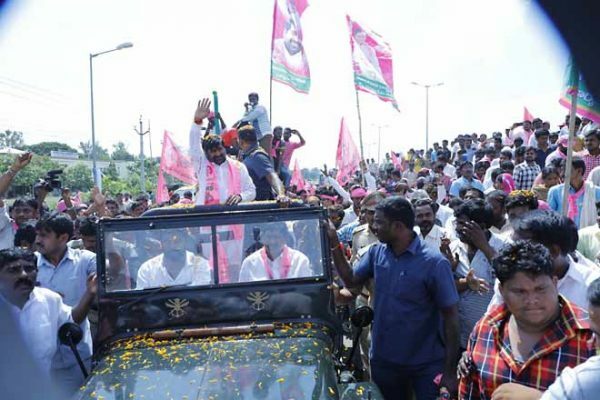 Jagadish Reddy was accorded a grand welcome by his supporters with a rally from SV College to his camp office in Suryapet, on his arrival to the Assembly constituency, his first visit after Chief Minister K Chandrashekhar Rao released the list of candidates contesting from 105 constituencies. Speaking on the occasion, Jagadish Reddy said that the people of Telangana would stand with the TRS in the next election and added that the verdict would be one-sided in its favour. “We don’t need the leadership of politicians who act like slaves to high commands in Delhi,” he said. Referring to the political conditions prevailing in the State, the Minister said that it was a historic occasion as people have the time again to taught a lesson to the Congress and TDP, which worked against the interests of Telangana. He said that the people should bring the TRS into the power again for all the development programmes to continue smoothly in the State. Stating that the TRS would win all 12 seats in the district, he made it clear that all the Congress candidates, including Telangana Pradesh Congress Committee (TPCC) Chief N Uttam Kumar Reddy and senior leader K Jana Reddy would lose deposits. Reminding Telugu Desam Party (TDP) leaders that the party was founded to fight the Congress, he said that the supposed pre-poll alliance between the TDP and the Congress was ‘unethical’. He said that the Congress and TDP would soon face existential crisis in the State and added that the pre-poll alliance between Congress and TDP would help the TRS win more seats that 2014, in the next elections. Reminding that TRS contested without the support of any party in 2014, the Minister made it clear that the TRS does not need open or secrete agreements with any other party. Stating that his victory from Suryapet Assembly constituency was a cake walk for him, he assured that he would work for the development of Suryapet. Suryapet Municipal Chairperson Ganduri Pravallika Prakash and other TRS leaders also participated in the rally.